Power up ! This compact control surface for our WheatNet-IP or BRIDGE TDM network has a lot of horsepower for demanding on-air or production studios. 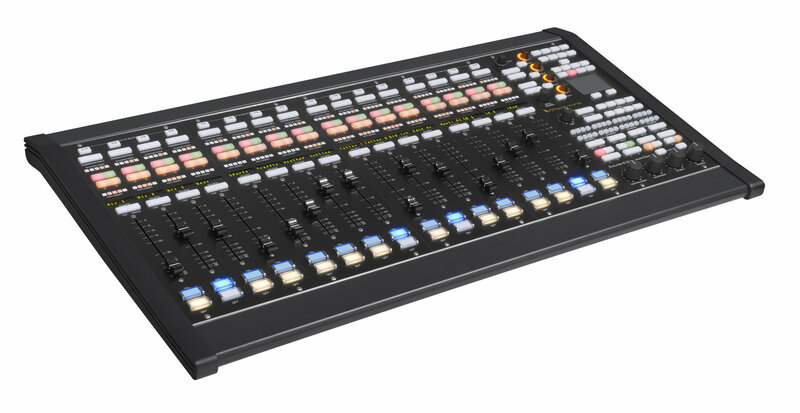 The E-6 has more faders, more source assignments, more mix-minus capability than you’ll ever need. 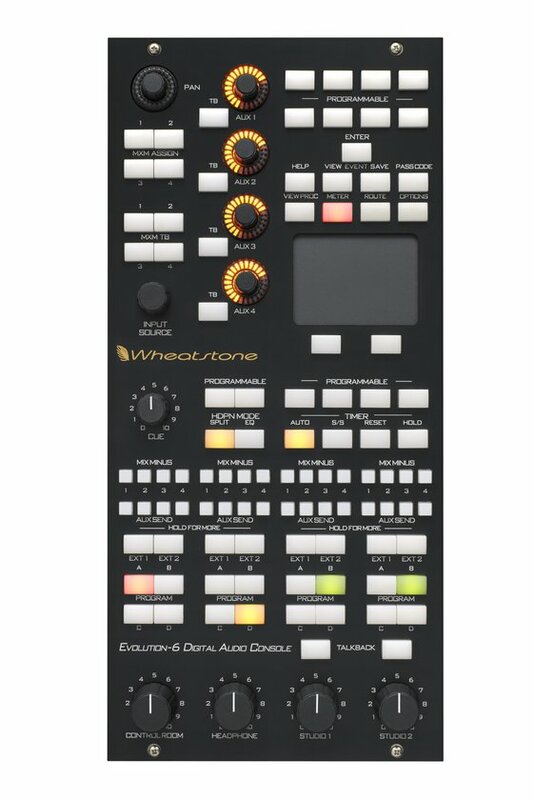 E-Series E-6 is a console control surface that interfaces with Wheatstone’s WheatNet-IP networking and routing system via a single CAT6 cable. No audio is routed or mixed in the surface itself. As a networked system, the console can access any source in your entire complex, sharing remote codecs or bringing up another studio’s program bus on the console. A user-supplied high-resolution graphic display monitor can provide vivid VU and peak level indication, as well as in-depth control and programming of the console. The E-6, the top of the line Wheatstone control surface, provides power and functionality for any radio on-air or production requirement, whether fast-action news, talk, and network origination, or major market music. The E-6 is also designed from the ground up for mixing surround sound for radio (or even TV). Its master panel provides comprehensive control of module functionality as well as monitoring and talkback for two studios. A popular feature is Vorsis-quality EQ, filtering, and dynamics processing on every fader ! The E-6 is also ideal for smaller market facilities, news and voice tracking booths, production rooms where the primary focus is on the digital workstation, and even major-market strictly-music operations.The E-6 surface provides extensive functionality for telephone talk and news formats, with four console-wide mix-minus busses as well as a dedicated mix-minus output from each channel with a talkback button right above the fader. E-6 surfaces can be intermixed with all other surfaces in the same system, such as our LX-24, L-8, E-1, Sideboard or our Talent Stations. All surfaces include event save and recall. Set events for the morning show, normal programming, special events, remotes, weekly shows, whatever you desire. Easily recall the event to completely reconfigure the console : sources, bus assignments, and settings. Set levels of access so that the more experienced operators can accomplish even the most complex tasks, while keeping the part-time weekend op out of trouble. The E-6 control surface embodies a robust feature set for complex on-air or production application to bring maximum control to minimum space with exceptionally intuitive operation. A touchpad and VGA monitor allow you complete access to an incredibly rich range of features. 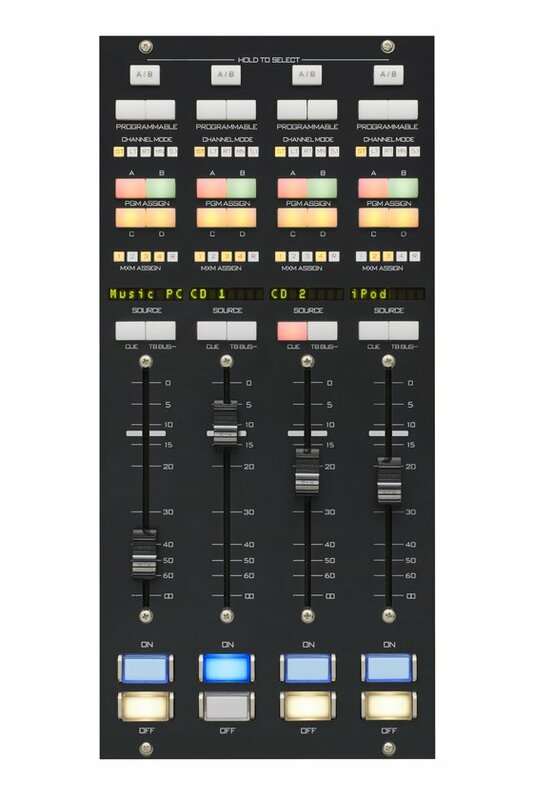 In addition to standard features such as 4 stereo mix buses, 4 mix-minus buses, 4 AUX buses and 8 character fader displays, the E-6 offers bus-minus on all faders with talkback, optional EQ/Dynamics on every channel (and with user recall for talent EQ settings), split headphone feed,100 presets and user login with privilege settings. The E-6 meter bridge uses a standard VGA monitor, which also displays surface information such as EQ/Dynamics, panning information and AUX bus settings. 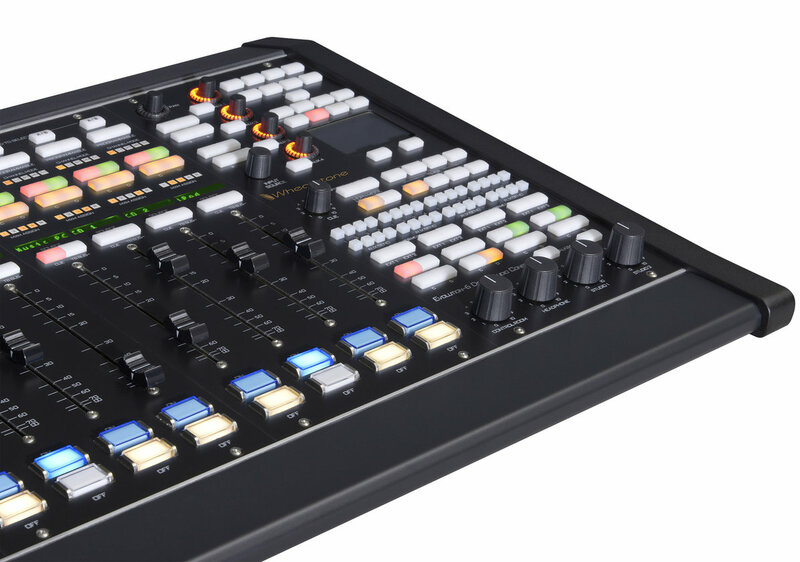 The E-6 control surface is equipped for both on-air and production studios and is available in 4, 8 or 12, 16, 20 or 24 fader configurations.